Africa: Why Are So Many Humanitarian Crises Under-Reported? 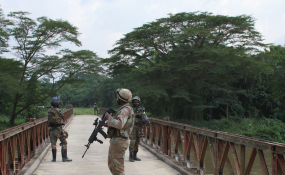 MONUSCO peacekeepers in Beni territory, North Kivu, Democratic Republic of the Congo. Norwich, UK — According to a recent poll of aid agencies by the Thomson Reuters Foundation, the most under-reported crisis of 2018 was the conflict in the Democratic Republic of Congo (DRC). Jan Egeland, head of the Norwegian Refugee Council, commented that 'the brutality of the conflict is shocking, the national and international neglect outrageous... I have seldom witnessed such a gap between needs and assistance'. Other 'forgotten crises', according to the agencies polled, include the Central African Republic, Lake Chad Basin, Yemen, Afghanistan, South Sudan, Burundi, Nigeria and, for the first time, Venezuela. Highlighting such 'reporting gaps' is important because international news coverage plays a key role in raising awareness of and drawing attention to humanitarian crises, in order to secure the funding needed to help. The 2018 U.N. funding appeal for the Democratic Republic of the Congo was less than 50 percent funded. Such under-funding is linked, albeit indirectly, to a lack of public awareness. In the UK, for example, a recent survey, commissioned by Human Appeal, showed that two thirds of adults were not aware of the recent violence in the DRC. In response, it is not enough to simply urge news organisations to do more. We need to understand the main causes of this acute lack of coverage of humanitarian affairs, in order to know what can be done about it. This is the aim of an ongoing academic research project into Humanitarian Journalism and was the focus of a report I published late last year entitled The State of Humanitarian Journalism with Dr Kate Wright at the University of Edinburgh and Dr Mel Bunce from City, University of London. The research makes clear that humanitarian journalism is itself in crisis. Our survey of over 1500 individuals involved in the aid sector, revealed widespread dissatisfaction with the quantity and quality of mainstream news coverage of humanitarian affairs. 73% of respondents agreed that mainstream news media does not produce enough coverage of humanitarian issues. News coverage was also criticised for being selective, sporadic, simplistic and partial. We also examined coverage of over 20,000 news outlets to find out how many were regularly reporting on humanitarian affairs. Only 12 covered the four humanitarian events we analysed. These events included the ongoing crisis in South Sudan, the 2016 Aceh earthquake, the 2016 World Humanitarian Summit and the 2017 UN appeal for humanitarian funding. The 12 news organisations which did cover all four of these events included Al Jazeera English, the Guardian Global Development site, IRIN News, the Thomson Reuters Foundation and Voice of America. Our analysis of their coverage showed that they do a better job than most at reporting humanitarian crises. These particular news organisations generally offer sustained and detailed coverage, regularly producing features, analysis pieces and even some campaigning reports. Furthermore, while journalists are often accused of telling very similar stories about disasters, we find that these particular news outlets actually varied significantly in how they covered such crises. For instance, we found that Thomson Reuters focused on stories about dramatic and timely events, while the specialist humanitarian news outlet IRIN wrote thematic pieces and analysis, targeted at global audiences. The main reason why few news organisations, and particularly commercial news outlets, regularly produce original coverage of humanitarian affairs is the very high costs involved. It is very expensive to fund on-the-ground reporters and the kinds of time-consuming research and travel necessary to explain the complex causes of humanitarian crises. In fact, we find that almost all international news outlets regularly covering humanitarian affairs rely on support from either states or private foundations. There are issues with both sources of funding. Foundation funding alone rarely offers journalists long-term ﬁnancial sustainability. Professor Rodney Benson, in the Department of Media, Culture, and Communication, at New York University, explains that, 'most major foundations see themselves as providing... short-term start-up support with the expectation that non-proﬁts will eventually achieve commercial sustainability'. In addition, there just isn't enough donor money to go around. Very few foundations are active in this area; often because of their objectives don't align with those of journalists or because of the difﬁculty of measuring the impact of their investments. This is why specialist non-proﬁt news outlets reporting on humanitarian issues struggle to survive. For example, despite featuring in our list as one of just 12 news outlets regularly covering humanitarian affairs, the news non-profit Humanosphere closed down in 2017 due to a loss of funding. Other foundation-dependent news organisations in this area that have either closed or dramatically downsized in recent months include News Deeply and the International Reporting Project. Support from Western governments can also subsidise the high costs of producing regular, original coverage of humanitarian affairs for radio stations like the BBC World Service and Voice of America (VoA). For instance, we found that humanitarian issues were mentioned in nearly one in ﬁve (19%) items on the news bulletins of the BBC World Service. However, there are important questions to be asked about the ways in which humanitarian news might be affected when governments support journalism as part of their foreign policy objectives - and to achieve 'soft power'. We found no evidence that government ofﬁcials directly interfered in editorial output of either World Service or VoA. However, a key problem, at both organisations, was the way in which journalists' ability to cover humanitarian issues in particular geographic regions waxed and waned in relation to governments' strategic and funding priorities. Such problems were even more acute at international news outlets, based outside the West and funded by state money. Journalists at Al Jazeera English, for example, faced considerable ethical dilemmas about how to cover events in areas where Qatar was involved militarily, or had diplomatic interests. This includes Yemen, Syria, Sudan and South Sudan. Given the inherent costs and challenges associated with funding humanitarian news, there are no easy answers to the question of how to increase coverage of under-reported crises. However, there is also some cause for optimism. In the Aid Attitudes Tracker, a large-scale survey of audiences in the UK, France, Germany and the US, more people claimed to follow news about "humanitarian disasters" (59%) either "closely" or "fairly closely" than any other type of international news (see Clarke et al 2018). Perhaps audiences are more interested in humanitarian journalism than many journalists think. Some may even be willing to pay for it. An audience survey for IRIN recently found that a majority (57%) would consider signing up to some form of paid subscription model. Encouraging audiences to pay directly for journalism they trust and value may ultimately be the only sustainable solution to the crisis facing humanitarian news. Dr Martin Scott is a Senior Lecturer in Media and International Development at the University of East Anglia, UK. The State of Humanitarian Journalism report is the latest publication from the ongoing Humanitarian Journalism Research Project by Dr Martin Scott, Dr Kate Wright and Dr Mel Bunce. This AHRC-supported research has involved interviews with nearly 200 journalists and media funders; as well as surveys and extensive newsroom observations.